“The Psychology of Gender and Health: Conceptual and Applied Global Concerns“ brings together different theoretical, developments experiences, and reflections from multiple areas and contexts of health in thirteen chapters. The all authors share the belief in the need to mainstream gender as a cross-cutting analytical category in health, and the merit of posing important and newly analyses health-related situations from a gender perspetive, whose importance and up-to-dateness are reaffirmed. The book examines the psychological aspects of the intersection between gender & health and demonstrates how gender should be strategically considered both at the most routine research tasks and the clinical practice. 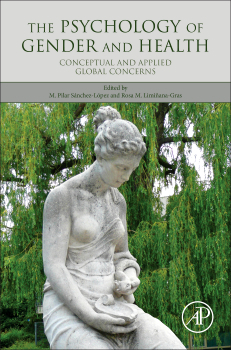 The book provides guidance on specific issues aimed at a wide audience, male and female psychologists in training, male and female professionals who are in practice, such men and women need to know how gender perspective is applied from different approaches and perspectives to be able to act as active agents in applying this perspective in research and treatment of health cases. Its aim is to show throughout the chapters how health analysis with a gender viewpoint has potential relevance in all studies and research and their application. This could be the case with health policies as argued in several chapters (for example 1,3, 7,10 or 12) where it is clearly shown what the basis of strategic considerations should be when establishing priorities or constructing the theory. Likewise, it aims to show (for example, Chapters 1 or 2), how the gender perspective in health has also to be borne in mind in the research tasks, such as preparing questions, designing methodologies and data interpretation. Its also responds to need for applying this approach in clinical contexts (chapters 9, 10 and 11), and aims to illustrate how gender interacts with social determinants, generating inequalities that affect health in different contexts (for example chapters 4, 5, 6, 7, 8, 13). Ultimately, it aims to be of use in the necessary task befalling every professional, academic, researcher or student of psychology, namely reviewing his/her scientific knowledge and the effectiveness of his/her practice.